Biork is 100% natural and plastic free crystal deodorant stick. The container is made of cork, a renewable resource. One single natural cork alone binds eight grams of the greenhouse gas CO2. In addition, cork helps to preserve one of the most biologically diverse habitats in Portugal. 100% natural, vegan, fragrance-free, no animal testing, no aluminium chlorides. 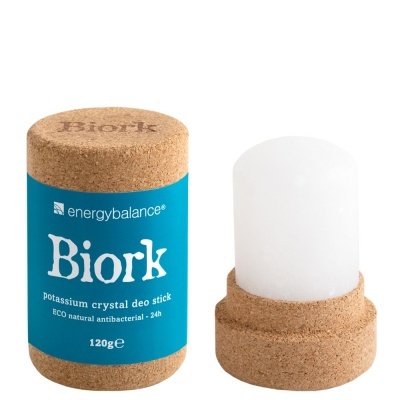 Biork crystal deodorant is a sustainable roll-on plastic free deodorant. Perfect for a zero waste lifestyle. People have been using potassium crystal since antiquity. It is particularly favoured in Asia where it is used as a natural antibacterial agent and deodorant. Potassium crystal is a mineral compound made up of alum and potassium crystals - a completely natural product. Sweating is a natural bodily function that regulates body temperature. Many bacteria find sweat zones to be the perfect environment in which to multiply. These bacteria are responsible for unpleasant odour. Biork crystal deodorant slows the production of bacteria and prevents the build-up of unpleasant odours. It lets the skin breath and perspire naturally. This is a natural anti-bacterial product, perfect for all types of skin – even the most sensitive. 100% natural, vegetable, hypo-allergenic, fragrance-free, no animal testing, no aluminium chlorides. The container is made of cork and also serves as a protective covering for the crystal. Cork is a renewable resource and is recommended by nature conservation associations. One single natural cork alone binds eight grams of the greenhouse gas CO2. In addition, cork helps to preserve one of the most biologically diverse habitats in Portugal. Moisten the tip of the stick and glide it gently over the important areas. Remember to dry the stick with, i.e., a towel after use. Cork trees save up to 30% more CO2 than other trees With an area of approximately 2.3 million hectares, the Mediterranean cork-oak forests absorb approximately 13 million tons of CO2 per year. Portugal's cork trees bind approximately 5% of the country's CO2 emissions. The bark of the cork oak is harvested every nine years and processed with little waste into various cork products. It is the only tree on earth, whose bark can be removed without harming the tree. A cork oak whose bark is harvested regularly binds even more than three times as much CO2 as an unused cork oak. In an attempt to reduce my plastic usage I've been looking for a good natural plastic free deodorant. I tried a bicarbonate based bar but it really didn't cut it. This Biork crystal stick is AMAZING! Biggest heatwave right now and fresh and not a whiff all day! Incredible! I'm also prone to underarm spots with traditional deodorant and this has totally cured that!